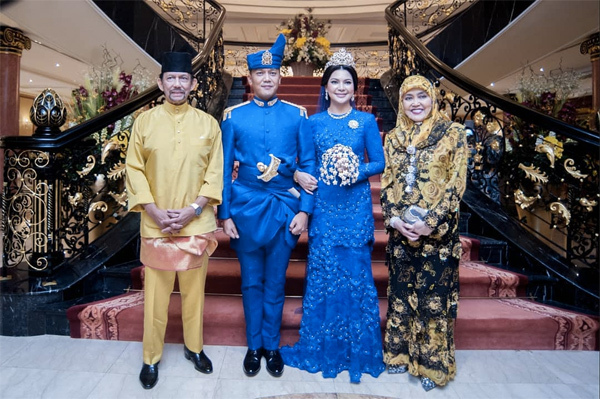 His Majesty Sultan Haji Hassanal Bolkiah Mu’izzaddin Waddaulah ibni Al-Marhum Sultan Haji Omar ‘Ali Saifuddien Sa’adul Khairi Waddien, Sultan and Yang Di-Pertuan of Brunei Darussalam, and Her Majesty Duli Raja Isteri Pengiran Anak Hajah Saleha binti Al-Marhum Pengiran Pemancha Pengiran Anak Haji Mohamed Alam with the newly weds, Yang Amat Mulia Pengiran Anak Haji Mohammed Saifullah and Yang Mulia Dayang Nur Akmalia binti Retired Lieutenant Colonel Awang Iskandar at Baitun Na’aim yesterday. 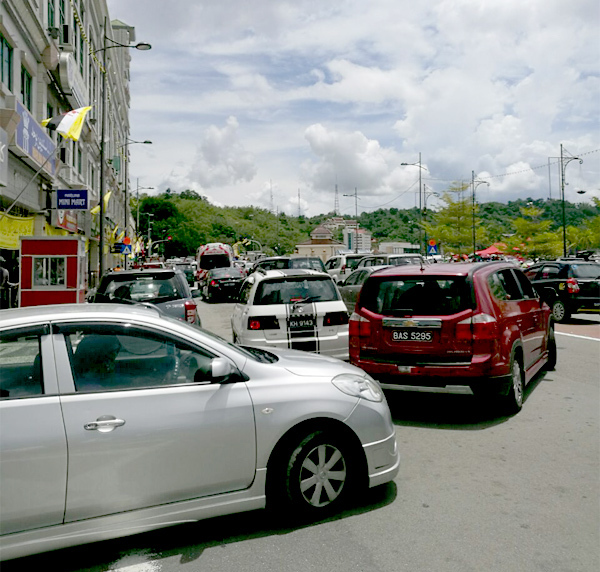 Image courtesy of Rahwani Zahari of Infofoto. 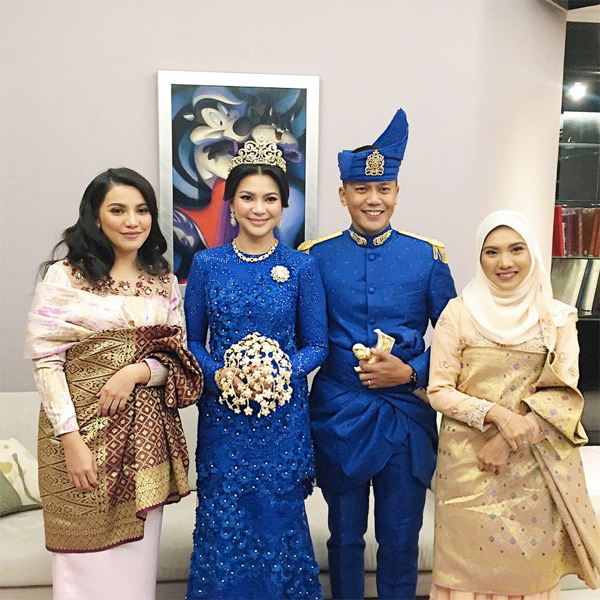 His Royal Highness Prince Haji Al-Muhtadee Billah, the Crown Prince and Her Royal Highness Paduka Seri Pengiran Anak Isteri Pengiran Anak Sarah binti Pengiran Haji Salleh Ab-Rahaman with the newly weds. 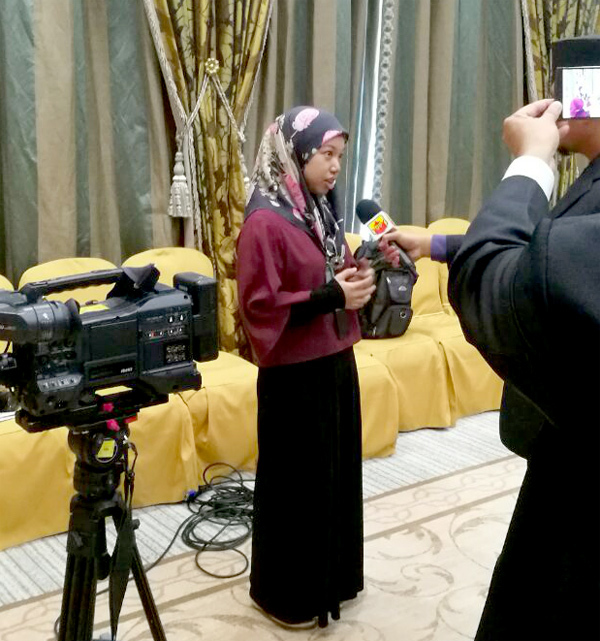 Image courtesy of Rahwani Zahari of Infofoto. 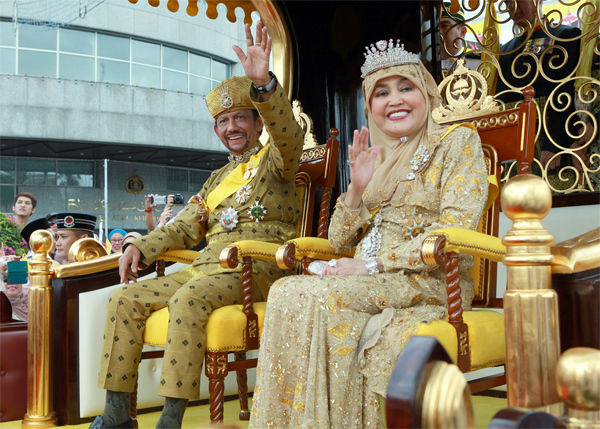 His Majesty Sultan Haji Hassanal Bolkiah Mu’izzaddin Waddaulah ibni Al-Marhum Sultan Haji Omar ‘Ali Saifuddien Sa’adul Khairi Waddien, Sultan and Yang Di-Pertuan of Brunei Darussalam, and Her Majesty Duli Raja Isteri Pengiran Anak Hajah Saleha binti Al-Marhum Pengiran Pemancha Pengiran Anak Haji Mohamed Alam, yesterday graced the Wedding Ceremony of Yang Amat Mulia Pengiran Anak Haji Mohammed Saifullah, the son of Her Royal Highness Princess Hajah Amal Umi Kalthum Al-Islam and Yang Amat Mulia Pengiran Indera Setia Diraja Sahibul Karib Pengiran Anak Haji Idris. 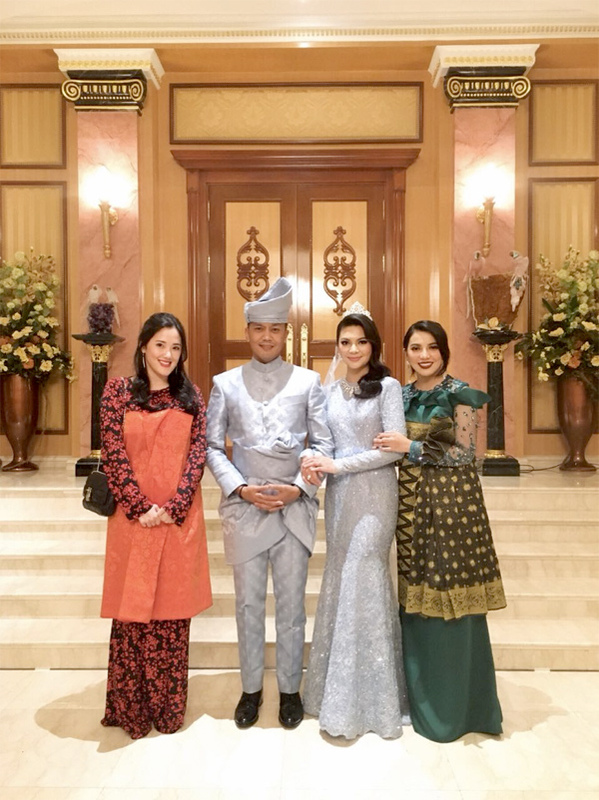 Upon arrival at Baitun Na’aim in Kampung Jerudong, His Majesty and Her Majesty Duli Raja Isteri were greeted by Her Royal Highness Princess Hajah Amal Umi Kalthum Al-Islam and Yang Amat Mulia Pengiran Indera Setia Diraja Sahibul Karib Pengiran Anak Haji Idris. 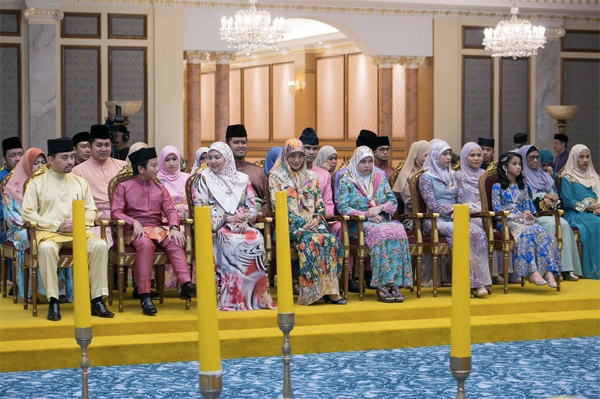 His Royal Highness Prince Haji Jefri Bolkiah; Her Royal Highness Princess Hajah Rashidah Sa’adatul Bolkiah; Her Royal Highness Princess Hajah Majeedah Nuurul Bolkiah; Her Royal Highness Princess Hajah Hafizah Sururul Bolkiah; Her Royal Highness Princess Fadzilah Lubabul Bolkiah; and Her Royal Highness Princess Ameerah Wardatul Bolkiah. 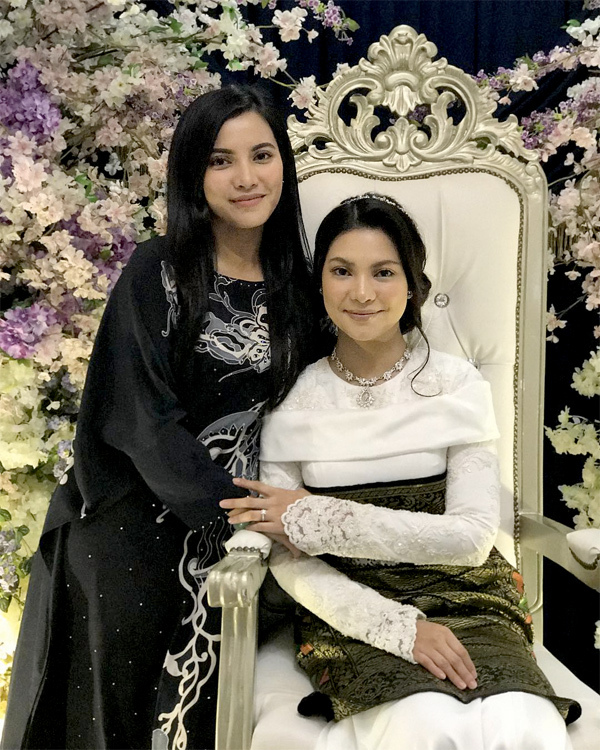 Also present were Her Royal Highness Princess Hajah Masna and Her Royal Highness Princess Hajah Amal Nasibah; and other members of the Royal Family. 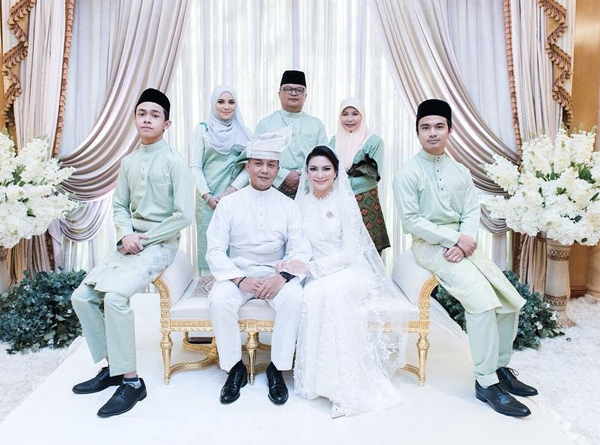 Yang Amat Mulia Pengiran Anak Haji Mohammed Saifullah is married to Yang Mulia Dayang Nur Akmalia binti Retired Lieutenant Colonel Awang Iskandar. 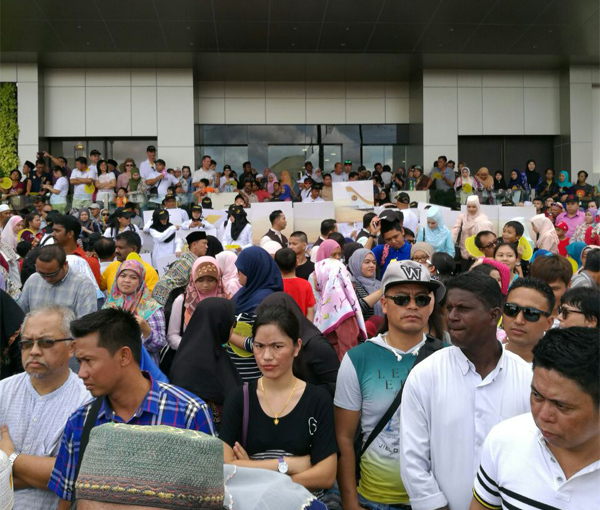 Doa selamat was read by Yang Berhormat Pehin Orang Kaya Paduka Seri Utama Dato Paduka Seri Setia Haji Awang Salim bin Haji Besar. 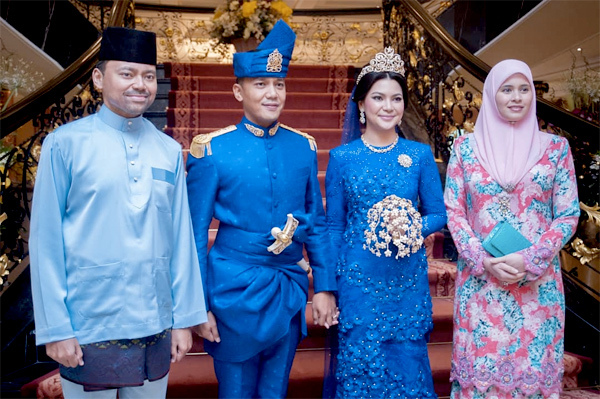 Their Majesties then received junjung ziarah from both the bride and bridegroom. 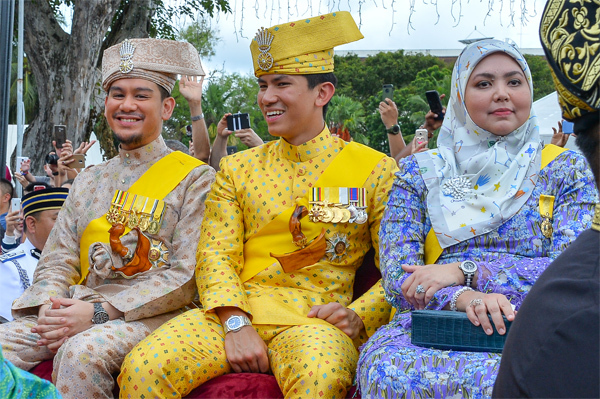 His Royal Highness the Crown Prince and Her Royal Highness Paduka Seri Pengiran Anak Isteri also received the junjung ziarah from the newly-wedded couple. 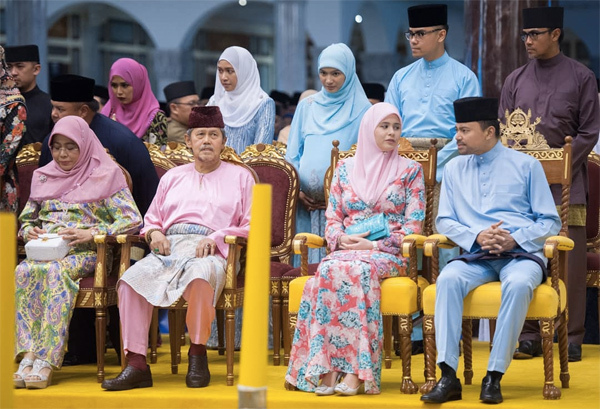 Also receiving the junjung ziarah were Her Royal Highness Princess Hajah Amal Umi Kalthum Al-Islam and Yang Amat Mulia Pengiran Indera Setia Diraja Sahibul Karib Pengiran Anak Haji Idris. New release by RTB. 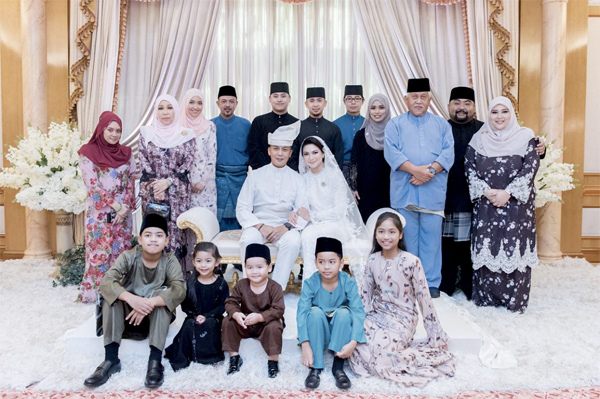 Members of the royal family during the Bersanding ceremony .Image courtesy of Rahwani Zahari of Infofoto. With Akmalia’s cousins. Image courtesy of Carrie Chong. 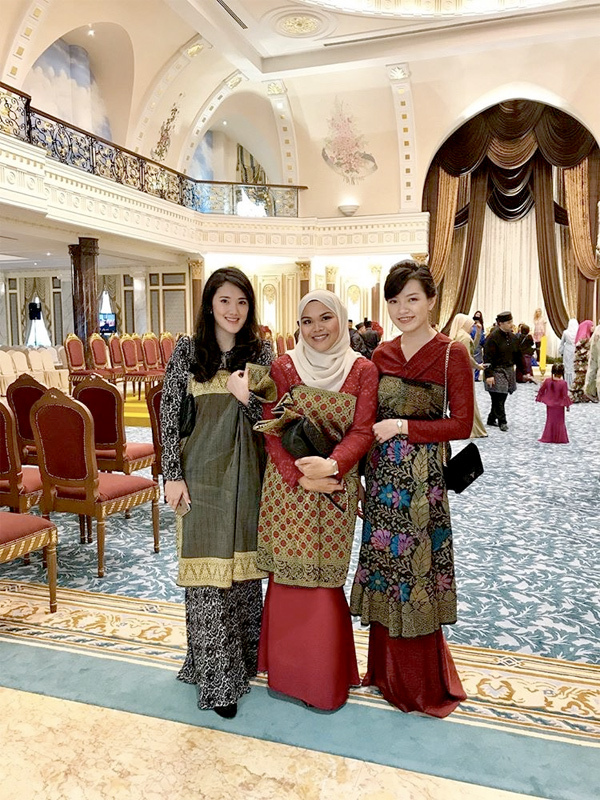 Apparently most of the ladies were wearing the songket at all the functions as it falls under the adat-istiadat customs. Image courtesy of Carrie Chong. 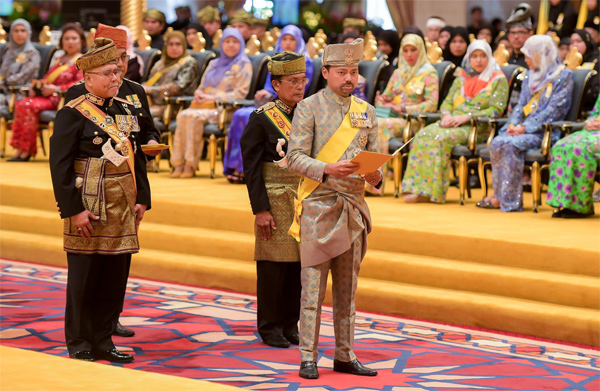 His Majesty Sultan Haji Hassanal Bolkiah Mu’izzaddin Waddaulah ibni Al-Marhum Sultan Haji Omar Ali Saifuddien Sa’adul Khairi Waddien, Sultan and Yang Di-Pertuan of Brunei Darussalam, His Royal Highness Prince Haji Al-Muhtadee Billah, the Crown prince and Senior Minister, His Royal Highness Prince ‘Abdul Malik, His Royal Highness Prince ‘Abdul Wakeel, His Royal Highness Prince Mohamed Bolkiah, Royal Highness Prince Haji Sufri Bolkiah and His Royal Highness Prince Haji Jefri Bolkiah during the Brunei National Anthem at the opening of the Hassanal Bolkiah Trophy 2018 at the Hassanal Bolkiah Stadium. 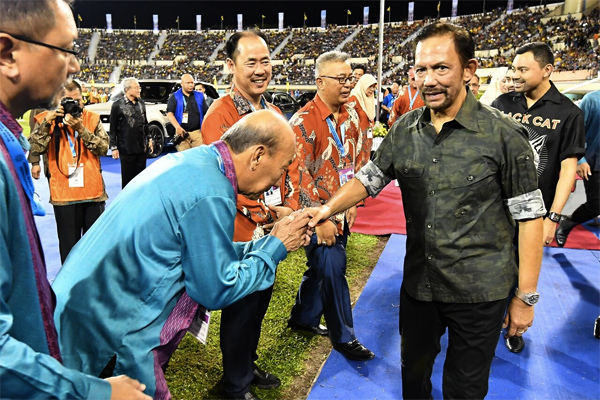 His Majesty Sultan Haji Hassanal Bolkiah Mu’izzaddin Waddaulah ibni Al-Marhum Sultan Haji Omar Ali Saifuddien Sa’adul Khairi Waddien, Sultan and Yang Di-Pertuan of Brunei Darussalam officially launched the Hassanal Bolkiah Trophy, HBT, for ASEAN Youths Football Tournament 2018. 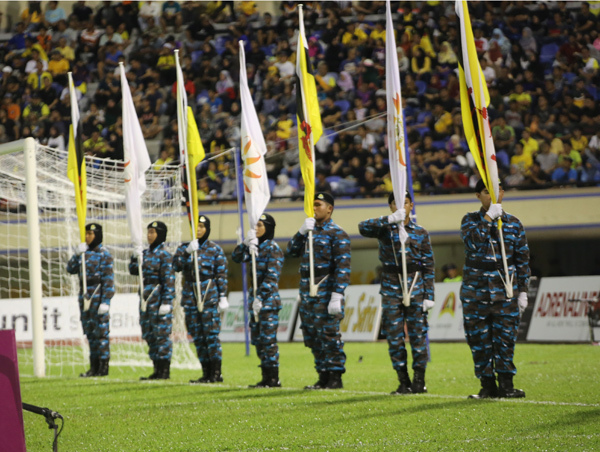 The ceremony took place at the Hassanal Bolkiah National Stadium, Berakas. Upon arrival, His Majesty was greeted by His Royal Highness Prince Haji Sufri Bolkiah ibni Al-Marhum Sultan Haji Omar Ali Saifuddien Sa’adul Khairi Waddien, President of the National Football Association of Brunei Darussalam as the Advisor of the Executive Committee of the Hassanal Bolkiah Trophy, HBT, for ASEAN Youths Football Tournament 2018. 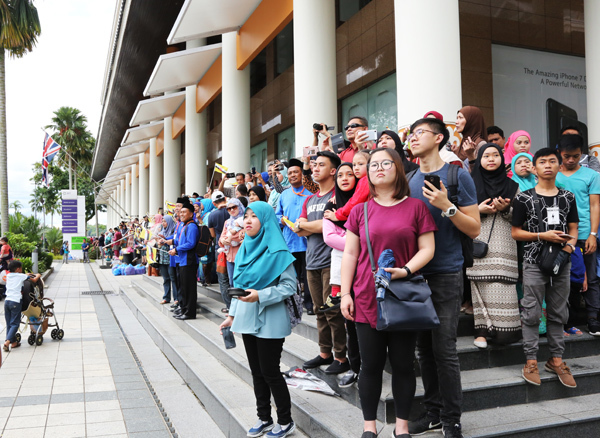 Also present to greet His Majesty’s arrival was Yang Berhormat Retired Major General Dato Paduka Seri Haji Aminuddin Ihsan bin Pehin Orang Kaya Saiful Mulok Dato Seri Paduka Haji Abidin, Minister of Culture, Youth and Sports as well as members of the Executive Committee. 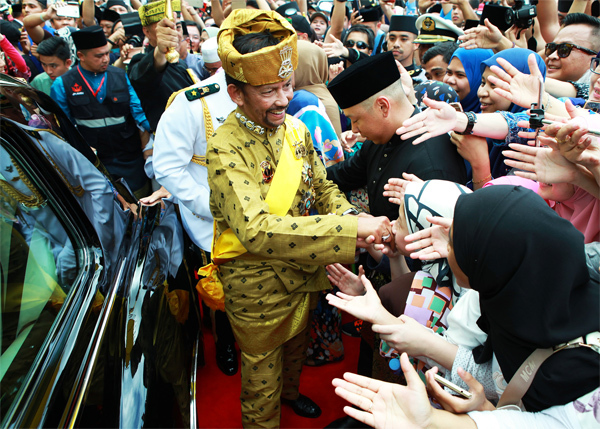 Soon after arrival, His Majesty received junjung ziarah from the sponsors. 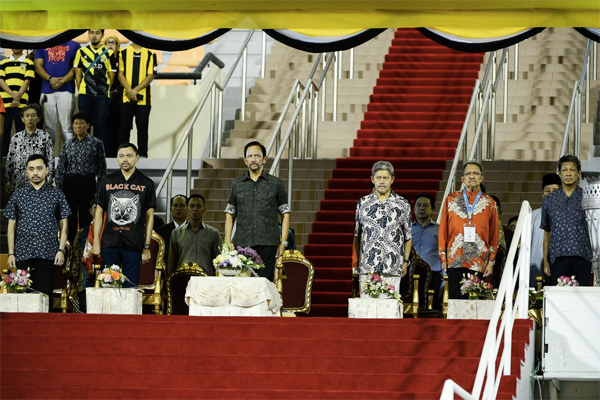 Also present were His Majesty’s sons and brothers, His Royal Highness Prince Haji Al-Muhtadee Billah, the Crown prince and Senior Minister at the Prime Minister’s Office; His Royal Highness Prince ‘Abdul Malik; His Royal Highness Prince ‘Abdul Wakeel; His Royal Highness Prince Mohamed Bolkiah and His Royal Highness Prince Haji Jefri Bolkiah as well as members of the Royal family. 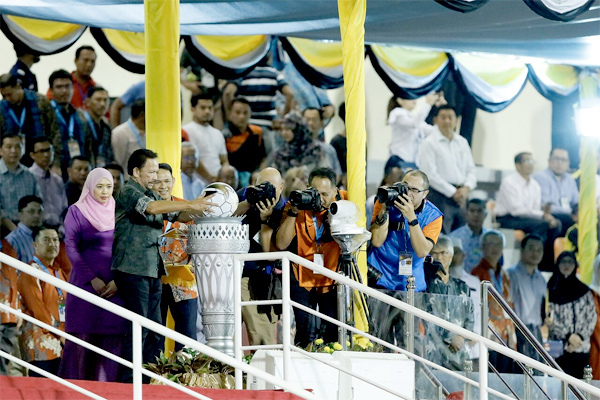 His Majesty then declared the Hassanal Bolkiah Trophy for ASEAN Youths Football Tournament 2018 officially opened. The opening ceremony was enlivened with firework display and Human LED performance. His Majesty was then introduced to the team managers, coaches and team captains. Seven countries are taking part in the tournament. 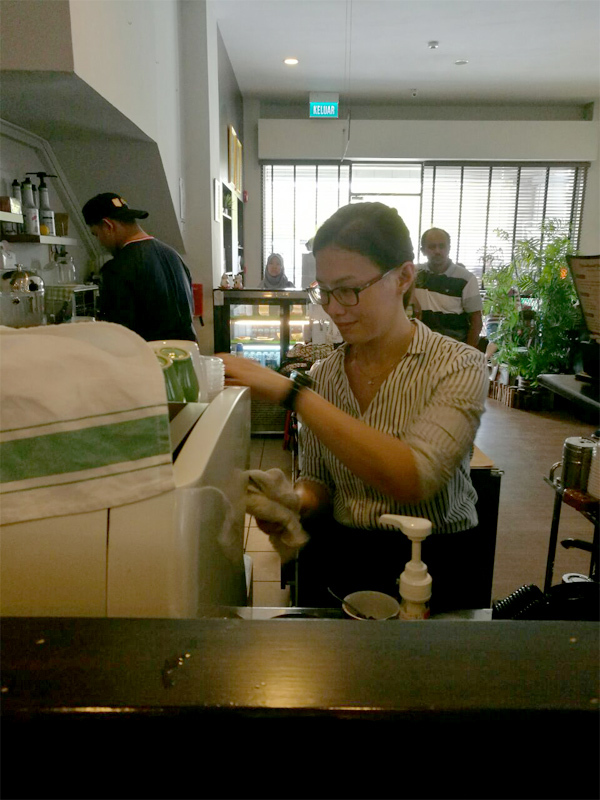 Group ‘A’ comprises teams from Brunei Darussalam, Timor Leste, Myanmar and Thailand; while Group ‘B’ are Lao PDR, Singapore and Cambodia. 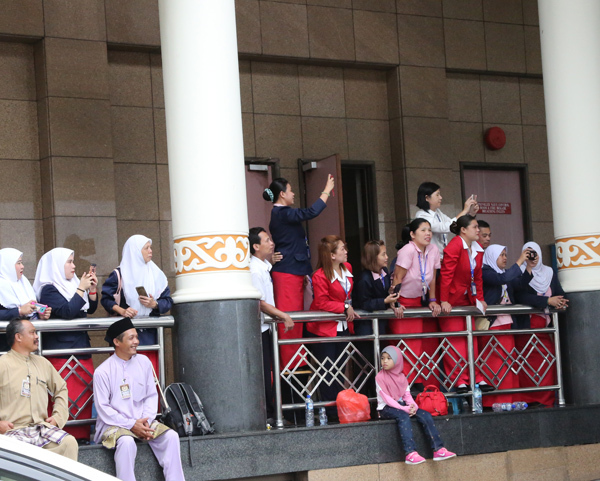 His Majesty also presented souvenirs to team managers of the participating nations. His Majesty then received a pasambah from the HBT 2018 Organising Committee. 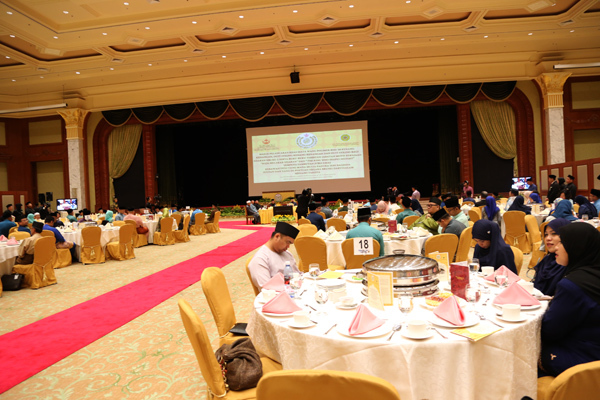 The Hassanal Bolkiah Trophy Football Tournament is jointly organised by the Ministry of Culture, Youth and Sports and the National Football Association of Brunei Darussalam, NFABD. 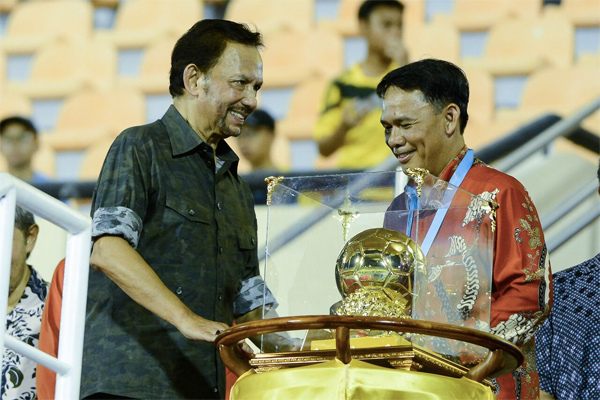 The tournament aims to uphold the Titah of His Majesty to involve the best teams in the ASEAN Region to compete in the ASEAN or South East Asian Football league. Press release by RTB and image courtesy of Infofoto. 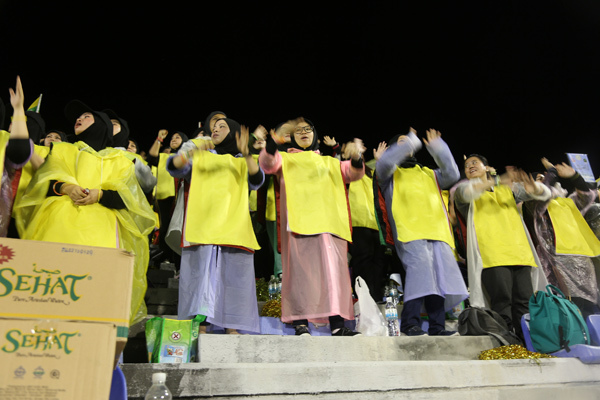 The Brunei Darussalam National team. 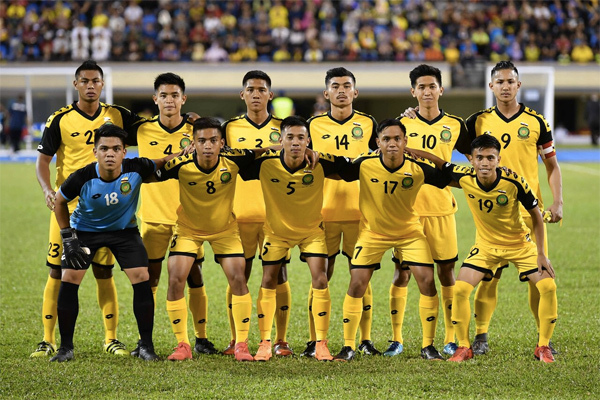 Back – Ak Yura Yunos, Ammar Syafie Hassanuddin, Muhammad Abdul Syakir, Martin Haddy Khalilidden, Azim Izamuddin Hj Suhaimi, Faiq Jefri Bolkiah (Captain). 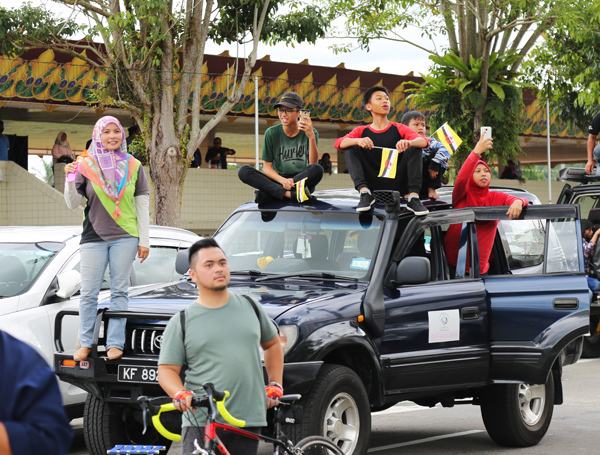 Front row – Ishyra Asmin Babidi, Naziruddin Hj Ismail, Haziq Kasyful Azim, Amin Sisa, Hanif Aiman Adanan. Image courtesy of Infofoto. Team Timor Leste National team. Back row – Fagio Augusto Da Silva, Henrique Wilson Da Cruz, Osvaldo Lucas Baptista, Rufino Walter Gama, Gumario Augusto Fernandes, Jorge Sabas Victor (Captain). Front row – Indio Ricardo Ferreira Alves, Silverio Da Rusereicao, Jose Maria Dos Reis, Candido Monteiro, Nelson Sarmento Viegas. Image courtesy of Infofoto. 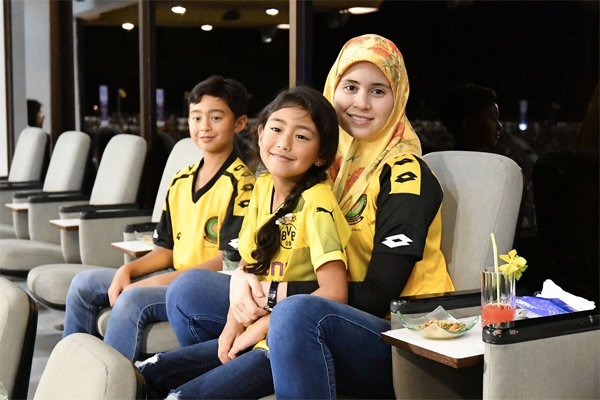 Not the start we wanted as a Brunei supporter and they were some mixed feelings about the performance last night at Hassanal Bolkiah Stadium. Our host nation took on Timor Leste in the opening match of the Hassanal Bolkiah Trophy and fell to a 1-0 narrow lost to the visitor on home turf. 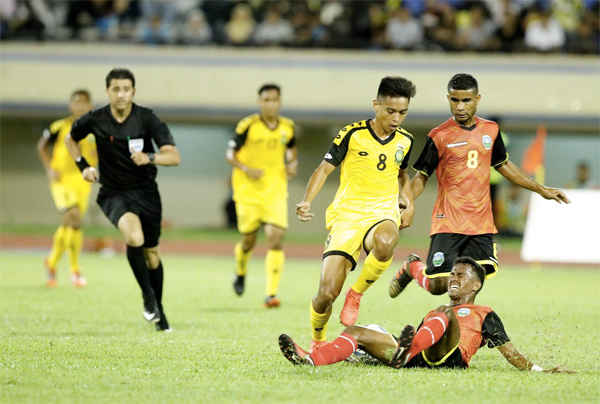 Timor Leste benefited from a solitary goal from the penalty spot in the first half after a Timor Leste player was alleged to have brought down in the box. Jose Maria Dos Reis cooly converted the penalty and held on till the final whistle. 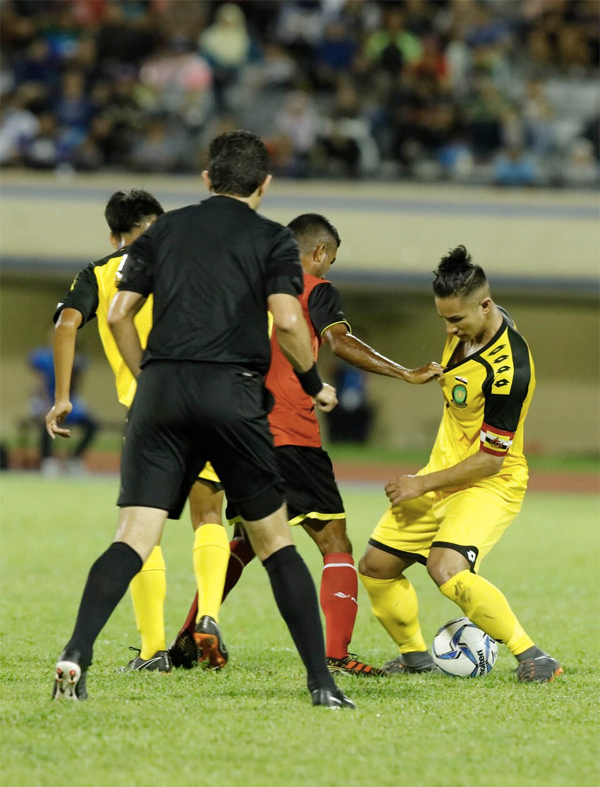 Brunei had great performances in their friendly matches leading to the first match against Timor Leste. However, the intensity and the cohesiveness of the team left more room for improvements. Sloppy passes and poor possession, Brunei struggled to hold the ball and hardly last after 4-5 passes whereas Timor Leste looked more controlled on and off the ball. This was apparent in the first half. Nonetheless, there were some players that helped help to calm the team down whenever Timor Leste began to threaten in attack. Ak Yura Yunos (No.23) in defence and Naziruddin Hj Ismail (No.8) in midfield help to hold the fort for Brunei throughout the 90 minutes. Another player that brought more purpose to the game was Faiq Jefri Bolkaih (No.9), the team captain in attack. Brunei’s best chances came from Faiq whose both efforts were cleared off the line, one a well struck left footer while the other, a guided header off a corner. The second half was a slightly better in terms of possession for Brunei though Timor Leste showed more confidence in all departments. The visitors were restricted to long shots and none of their efforts troubled Ishyra Asmin Jabidi in goal. 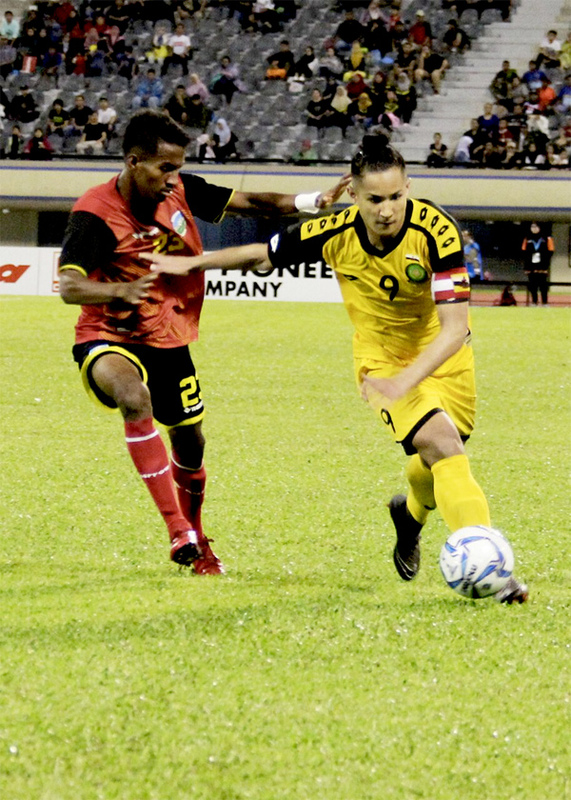 Timor Leste was also good when countering and almost doubled their lead when substitute Muhammad Ramie Ramlli gave away a sloppy pass in midfield but Timor Leste failed to capitalize. 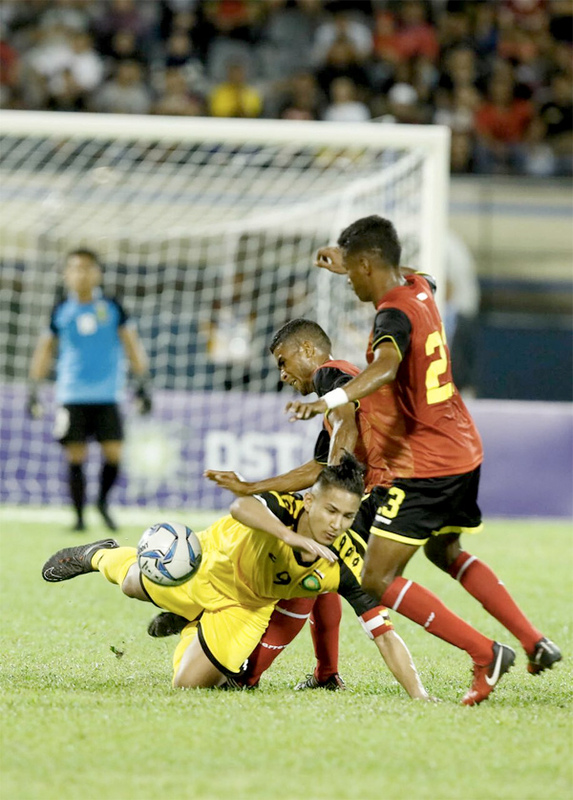 Fabio Augusto Da Silva (No.20), Timor Leste’s goalkeeper, had little workout in the second half as Brunei failed to muster any form of chance to trouble the keeper. A long ball strategy would have benefited the isolated Faiq upfront due to his physique and the ability to hold the ball. However, Timor Leste were so disciplined at the back and their larger body physique gave more advantage against our local players. Kudos to Timor Leste on a professional display on the pitch and deserved the narrow victory over the host nation. 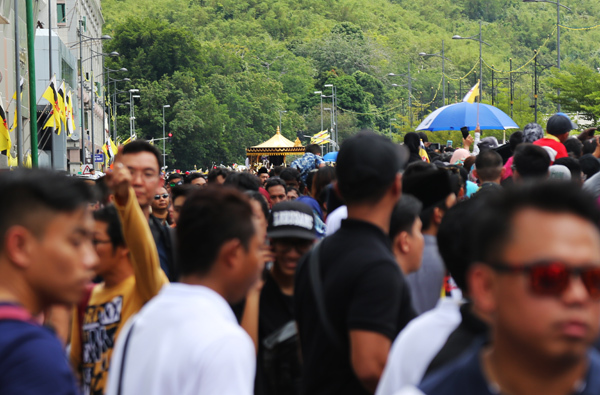 Mario Riviera Campesino, head coach of Brunei Darussalam, commented that Brunei showed nervousness in the first half and this is due to the over excitement leading to the tournament and forgetting to be focused on the match. 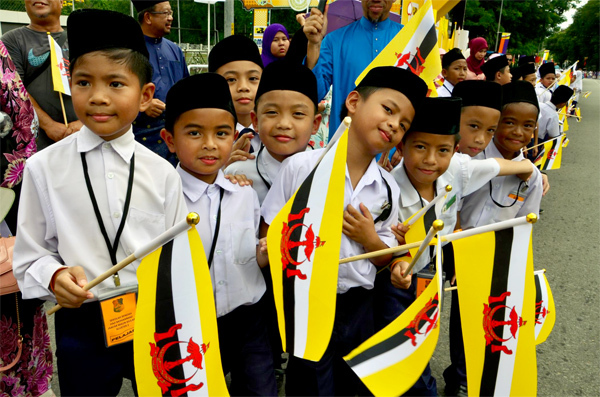 He is confident that Brunei will improve in the upcoming matches and win the remaining matches to qualify for the semi-finals. 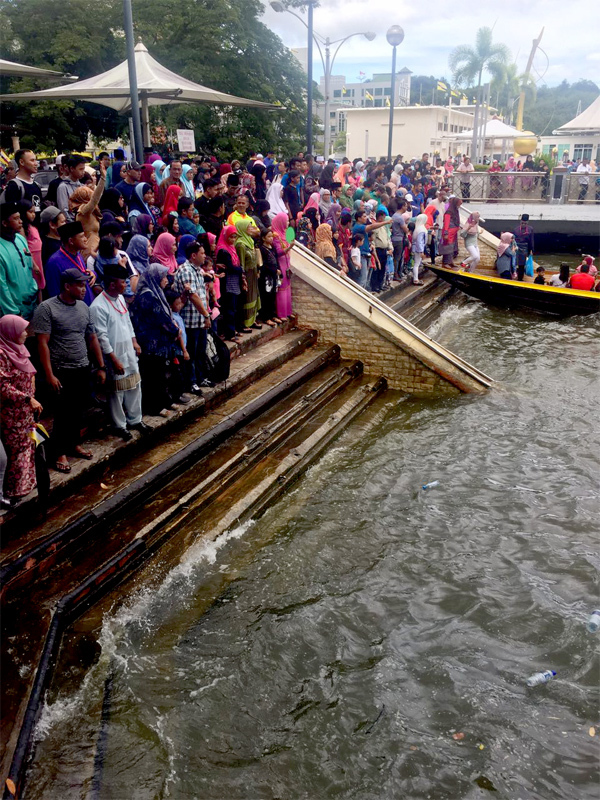 Brunei now have a huge task in the group of death. They are up against two times defending champion Thailand and the defending champion Myanmar. Will this be difficult? Yes. But is it impossible? No. Brunei did show some promise and let’s put our trust in the players selected by the head coach in the upcoming matches. I believe we have the quality and the desire to be better than we were last night. Myanmar will take on Thailand in a mouth watering match at Belapan Sports Complex tonight. 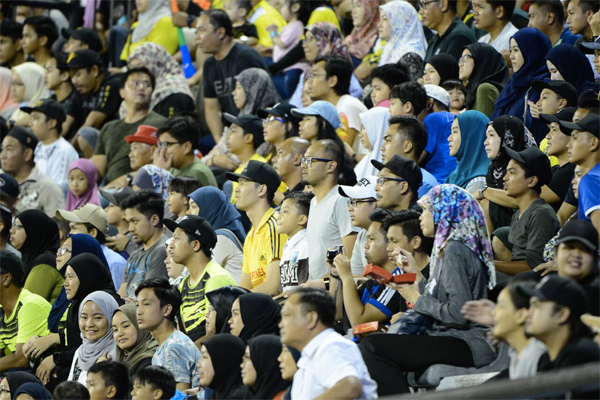 Brunei will have two extra days before they face Thailand at Hassanal Bolkiah Stadium on Friday evening. 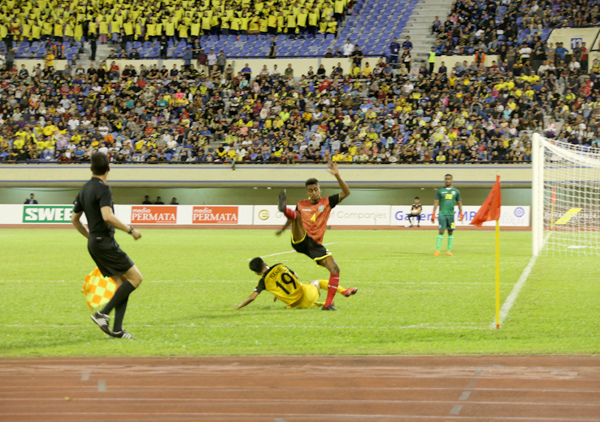 Naziruddin Hj Ismail of Brunei Darussalam skipped a tackle during the match. Image courtesy of Infofoto. Hanif Aiman Adanan attempting to win a challenge. He gave away possession cheaply especially in the first half. I hope he can bounce back against Thailand this coming Friday. Faiq Jefri Bolkiah holding the ball against Nelson Sarmento Viegas. He had two great chances to equalize but his efforts were cleared off the line. A promising talent for the national team. . Image courtesy of Infofoto. Faiq Jefri Bolkiah had a subdued second half as his team mates weren’t able to supply him the ball in the final third. 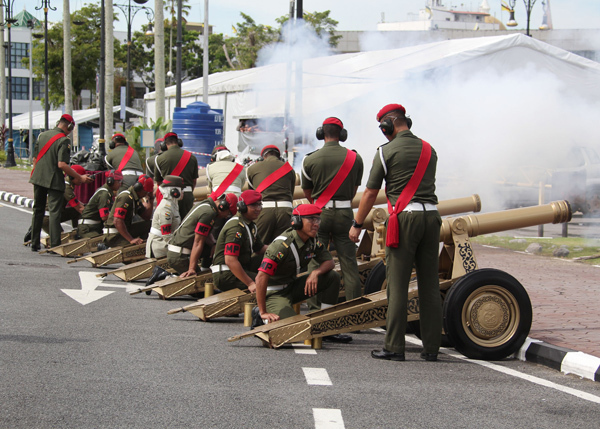 Kudos to Timor Leste for their discipline in defence and as a unit. . Image courtesy of Infofoto. 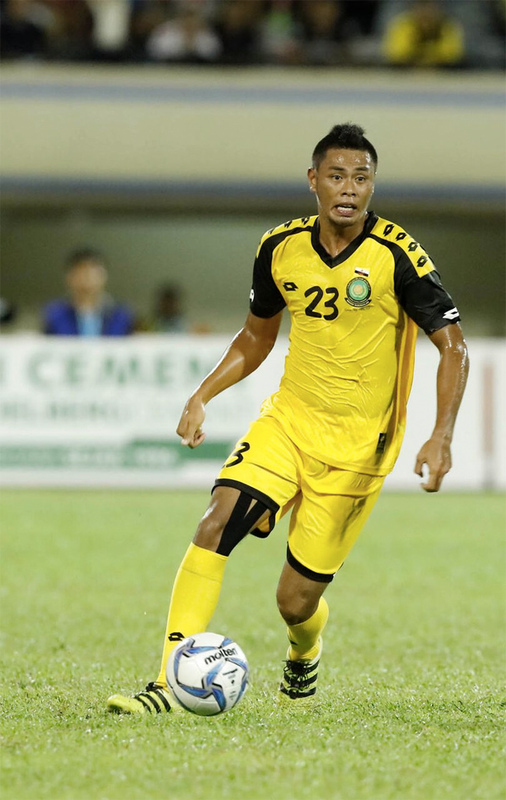 Ak Yura Yunos helped Brunei’s defence and also calmed the storm from Timor Leste. It would have been a different story without the presence of Ak Yura Yunos. . Image courtesy of Infofoto. 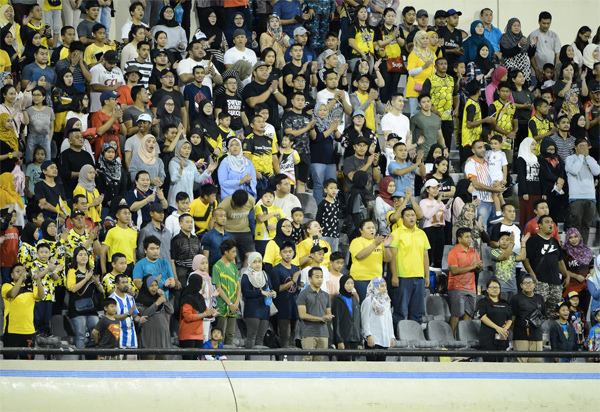 The HBT supporters sang and chanted during period of the match to boost the morale of the players. 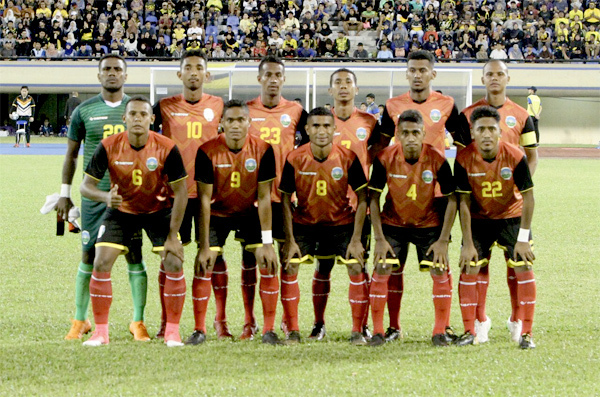 Timor Leste head coach Gelasio Da Silva Carvalho even said that his players couldn’t hear his instructions from the bench due to the overwhelming chants from the supporters. It wasn’t a full house but I could say almost 90% of the stadium was filled up. . Image courtesy of Infofoto. I can see my friends 😀 . Image courtesy of Infofoto. His Royal Highness Prince Haji Al-Muhtadee Billah Ibni His Majesty Sultan Haji Hassanal Bolkiah Mu’izzaddin Waddaulah, the Crown Prince and Senior Minister at the Prime Minister’s Office, yesterday attended the Launching Ceremony of the Brunei 50 dollar Commemorative Polymer Note, Commemorative Coins and the 5th Series of Coins in Circulation, and the State Mufti’s Office publications entitled ‘Raja Melakar Sejarah’ and ‘The King who Shapes History’ in conjunction with the Golden Jubilee Celebration of His Majesty the Sultan and Yang Di-Pertuan of Brunei Darussalam’s Accession to the Throne. 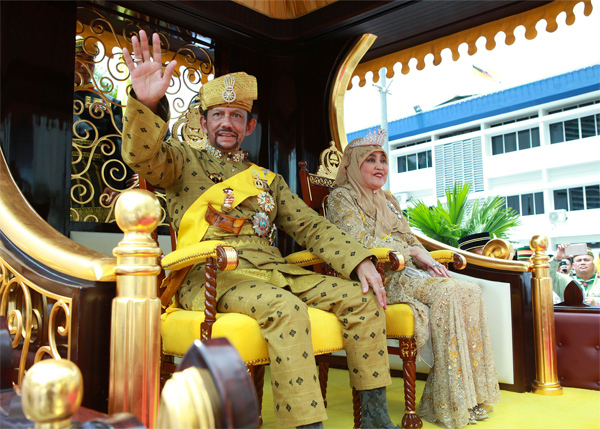 His Royal Highness is the Patron of the Advisory Committee for the Golden Jubilee Celebration and Chairman of Autoriti Monetari Brunei Darussalam Board of Directors. 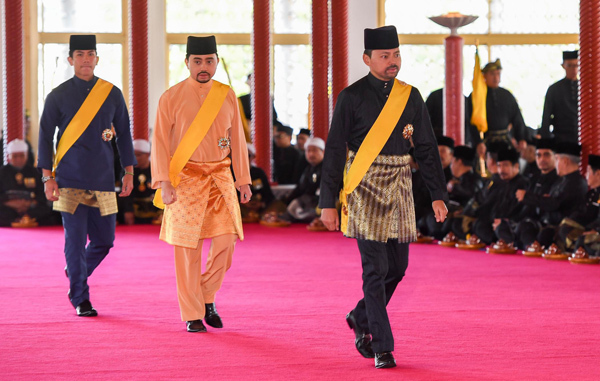 Upon arrival at the Prime Minister’s Office, His Royal Highness was greeted by His Royal Highness Prince Haji Sufri Bolkiah ibni Al-Marhum Sultan Haji Omar ‘Ali Saifuddien Sa’adul Khairi Waddien, as member of the Advisory Committee for the Golden Jubilee Celebration of His Majesty’s Accession to the Throne. Also welcoming His Royal Highness were the co-chairpersons of the Executive Committee for the Golden Jubilee Celebration, Yang Amat Mulia Pengiran Lela Cheteria Sahibun Najabah Pengiran Anak Haji Abdul Aziz bin Pengiran Jaya Negara Pengiran Haji Abu Bakar, Yang Di-Pertua of Adat Istiadat Negara; Yang Berhormat Pehin Orang Kaya Seri Kerna Dato Seri Setia Doctor Haji Awang Abu Bakar bin Haji Apong, Minister of Home Affairs; Yang Berhormat Pehin Orang Kaya Laila Setia Dato Seri Setia Awang Haji Abdul Rahman bin Haji Ibrahim, Minister at the Prime Minister’s Office and Second Minister of Finance; Yang Berhormat Pehin Datu Seri Maharaja Dato Paduka Seri Setia Doctor Ustaz Haji Awang Abdul Aziz bin Juned, the State Mufti; and Dato Seri Paduka Awang Haji Mohd Roselan bin Haji Mohd Daud, Deputy Minister at the Prime Minister’s Office. 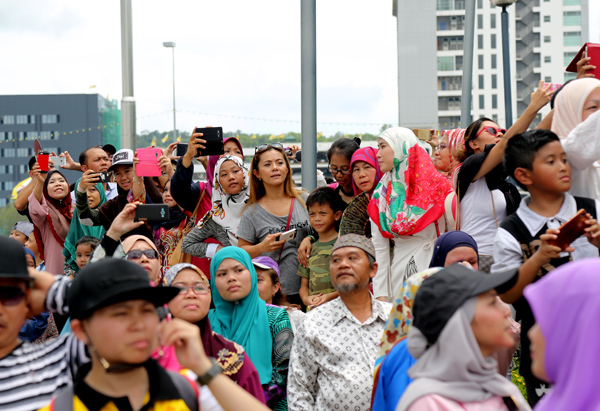 The ceremony organised by Authority Monetary Brunei Darussalam, AMBD, began with the reading of Surah Al-Fatihah led by Yang Berhormat Pehin Datu Imam Dato Paduka Seri Setia Ustaz Haji Awang Abdul Hamid bin Bakal. 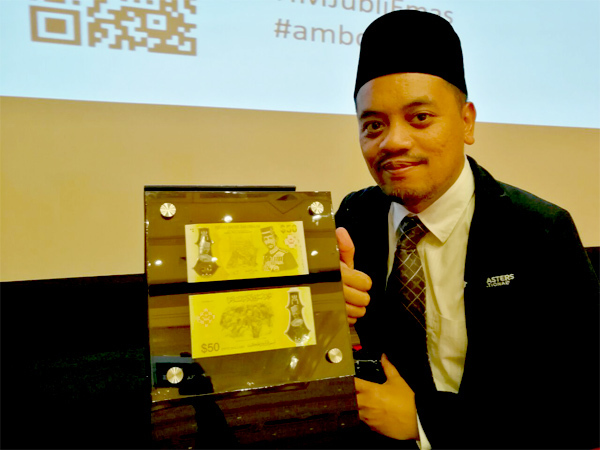 Yang Berhormat Pehin Orang Kaya Seri Kerna Dato Seri Setia Doctor Haji Awang Abu Bakar in his welcoming speech explained the design concept of the Brunei 50 Dollar polymer note, commemorative coins and 5th Series of Coins in Circulation. 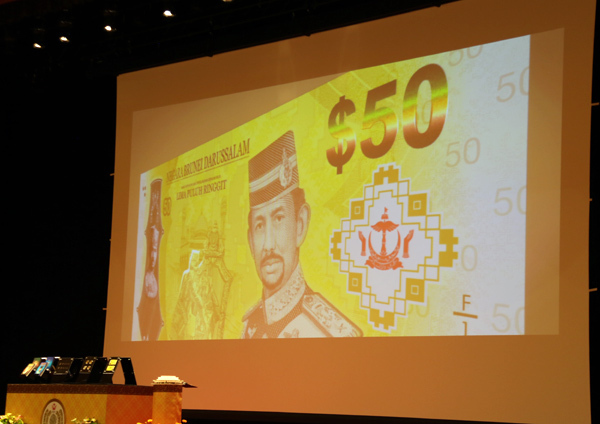 The design concept of the Brunei 50 dollar polymer note was inspired from the caring and attentive nature of His Majesty that signifies the monarch’s personality as The People’s Monarch. 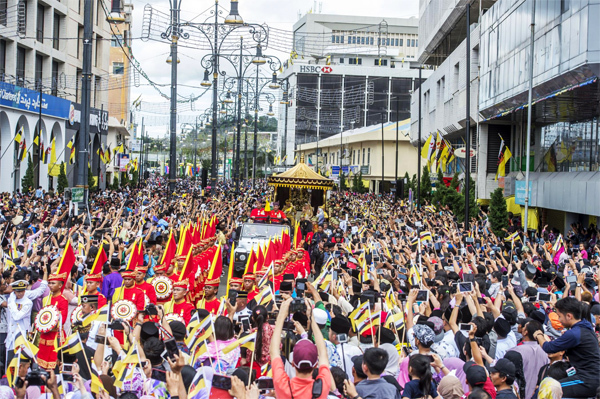 The currency also portrays His Majesty’s priority in instilling religious principles and reflecting the country’s era of modernisation under the monarch’s reign. 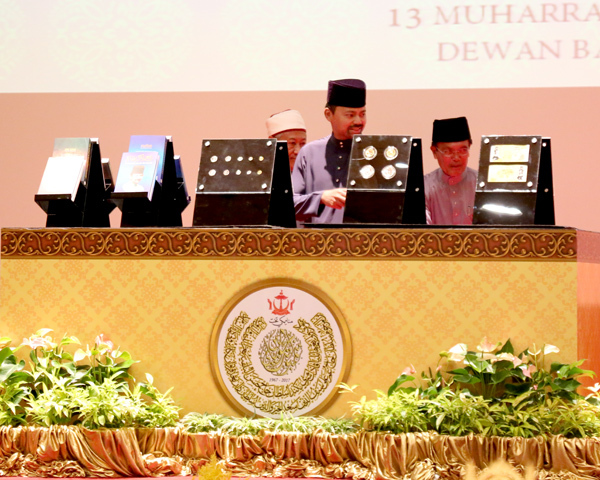 His Royal Highness officiated the launch of the Brunei 50 dollar Commemorative Polymer Note, Commemorative Coins and the 5th Series of Coins in Circulation, as well as the State Mufti’s Office publications entitled ‘Raja Melakar Sejarah’ and ‘The King who Shapes History’. 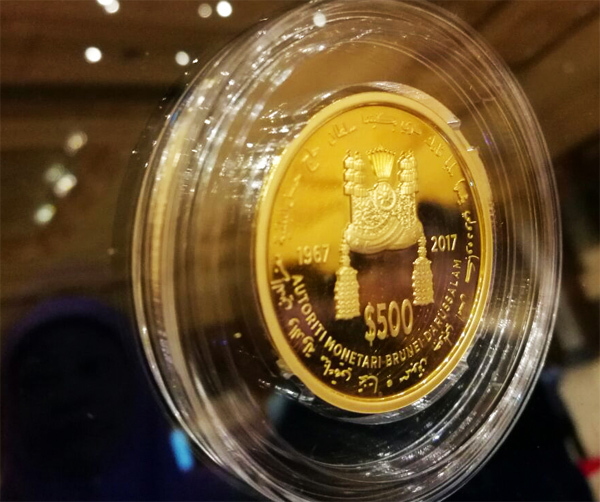 AMBD will be issuing 500,000 of the commemorative 50 cents which will be available for public exchange at face value across all banks and its branches from Monday, 9th of October. An exclusive collection of several types of limited edition numismatic note and coin sets will also be available for pre-order from today, 4th of October. 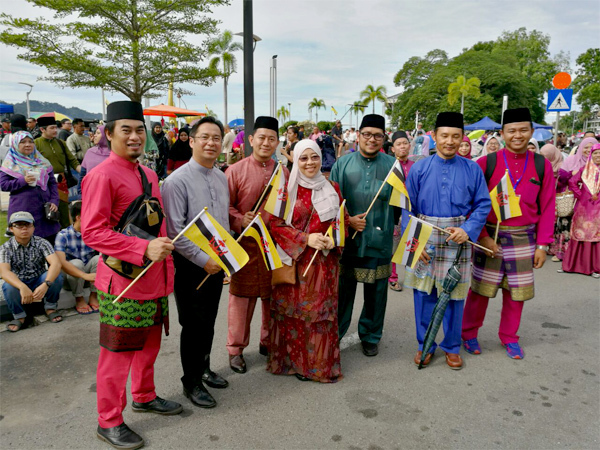 Meanwhile, the book entitled ‘Raja Melakar Sejarah’ which is filled with the history of His Majesty’s 50 year reign is written by Yang Berhormat Pehin Datu Seri maharaja Dato Paduka Seri Setia Doctor Ustaz Haji Awang Abdul Aziz bin Juned, the State Mufti. 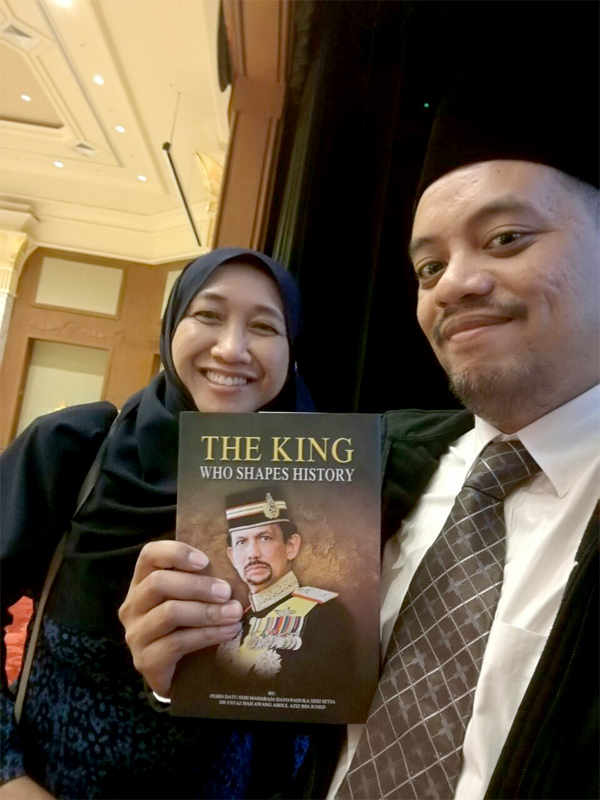 The book’s publication in the Malay and English Languages is hoped to contribute towards portraying His Majesty’s image as the Head of State and Head of Government. The books will be available for sale tomorrow at the State Mufti’s Office, Jalan Pengiran Babu Raja. 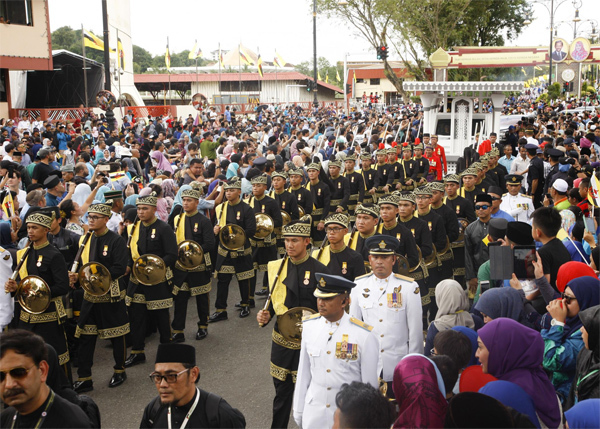 Before leaving the ceremony, His Royal Highness received junjung ziarah from members of the Executive Committee for the Golden Jubilee Celebration, members of the Autoriti Monetari Brunei Darussalam Board of Directors, senior officers of the State Mufti Department and Autoriti Monetari Brunei Darussalam as well as the special launching ceremony committee members. From RTB news. Rano’s thoughts: I managed to pre-order the limited pieces through Autoriti Monetari Brunei Darussalam (AMBD) website and it will be available some time in November 2017. 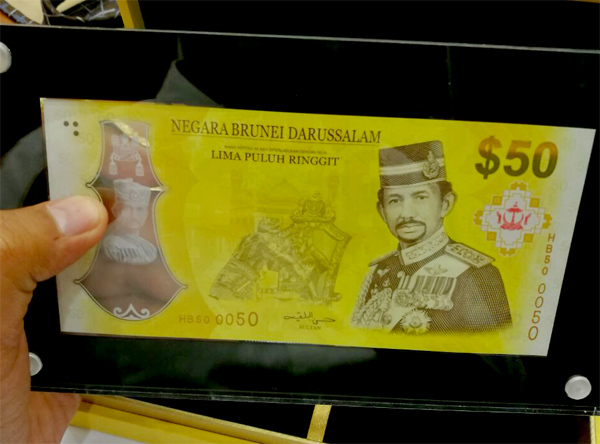 I was already impressed with previous edition – the 50 years Brunei Darussalam-Singapore Currency Interchangeability, and now AMBD have raised the bar with the Brunei 50 dollar Commemorative Polymer Note, Commemorative Coins and the 5th Series of Coins in Circulation. The AMBD website crashed a few times yesterday after it was officially online, showing the demands for the 9 items available for order. The website now is back to normal and will be able to accommodate the demand. In a space of a few hours, they managed to have roughly 1,000 pre-order transactions. That was quite impressive and I believe many are eyeing the commemorative notes and coins. 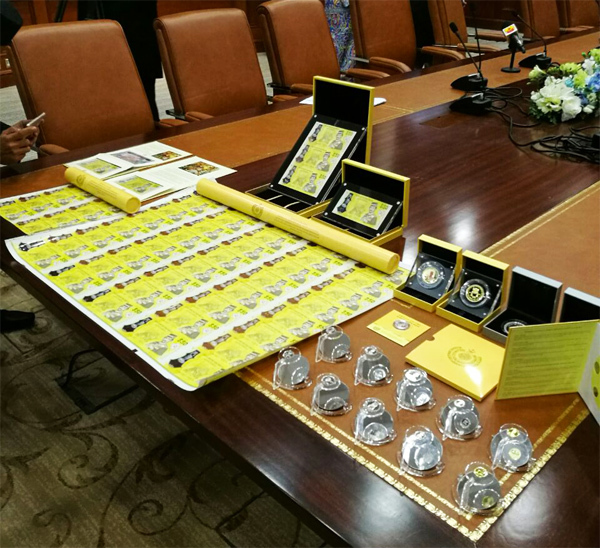 Another proud moment to cherish for Brunei is that AMBD has allocated around 100,000 pieces of 50 coins in special packaging which will be distributed to students (registered under the Ministry of Education) in all public and private school from pre-school students to sixth form students in all four districts later in the year. That’s pretty awesome I must say. 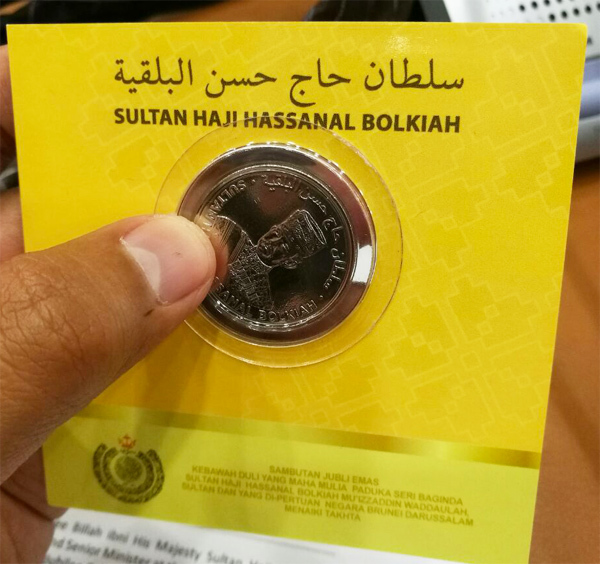 It will be a good way to commemorate The Sultan of Brunei’s 50 years of harmonious and peaceful ruling of Brunei Darussalam. Thank you, AMBD, for the invitation of the launch and I shall be waiting for my new collection pretty soon 😀 You can view the collection and pre-order the items. 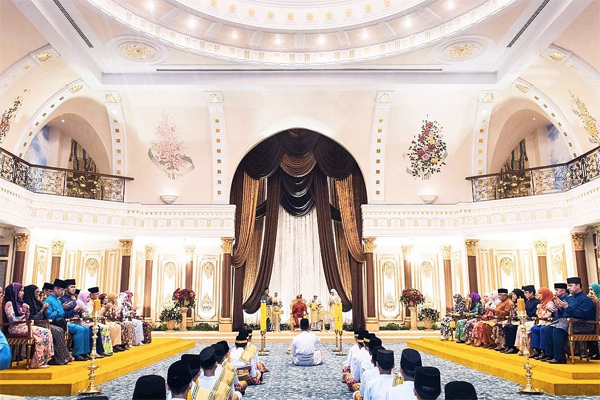 The Golden Jubilee Celebration of His Majesty the Sultan and Yang Di-Pertuan of Brunei Darussalam’s Accession to the Throne began yesterday with the Majlis Istiadat Membuka Gendang Jaga-Jaga or the Opening of the Playing of Traditional Musical Instruments at the Lapau in Bandar Seri Begawan. 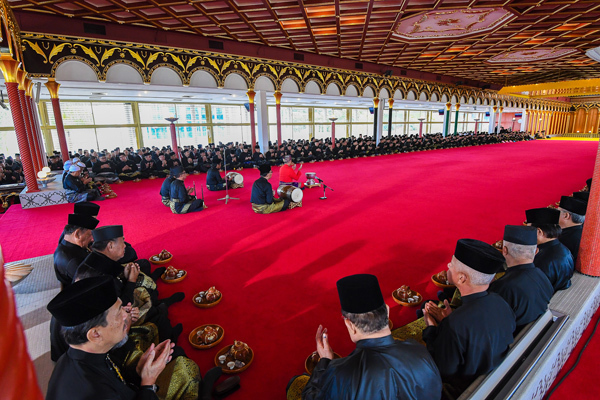 The Majlis Istiadat Membuka Gendang Jaga-Jaga was conducted in the presence of His Royal Highness Prince Haji Al-Muhtadee Billah ibni His Majesty Sultan Haji Hassanal Bolkiah Mu’izzaddin Waddaulah, the Crown Prince. 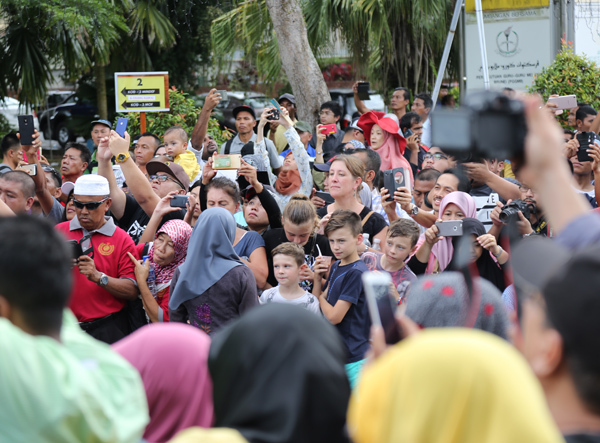 Upon arrival, His Royal Highness the Crown Prince was welcomed by Yang Amat Mulia Pengiran Lela Cheteria Sahibun Najabah Pengiran Anak Haji Abd Aziz bin Pengiran Jaya Negara Pengiran Haji Abu Bakar. 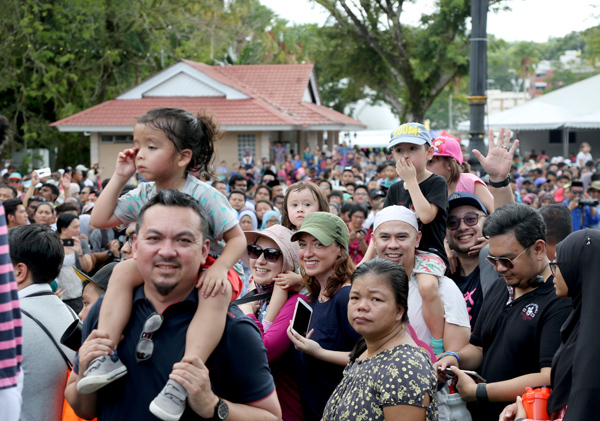 Also present were His Royal Highness Prince ‘Abdul Malik and His Royal Highness Prince ‘Abdul Mateen and other members of the Royal Family. 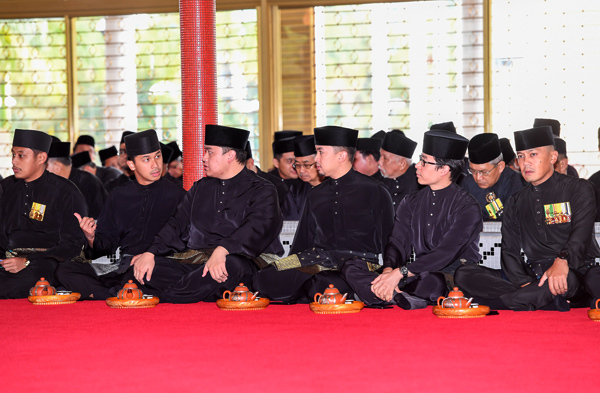 Soon after His Royal Highness the Crown Prince was seated, the Juru Laki Awang Haji Johan Areffen bin Hassan, accompanied by other musicians entered, bearing traditional musical instruments such as Serunai or Flutes and Gendang Labek or a type of drum and took their seats at a specially allocated position. The ceremony began with Yang Dimuliakan Pehin Orang Kaya Seri Dewa (Retired) Major General Dato Seri Pahlawan Awang Haji Mohammad bin Haji Daud informing Yang Amat Mulia Pengiran Lela Cheteria Sahibun Najabah Pengiran Anak Haji Abdul Aziz that the Istiadat Membuka Gendang Jaga-Jaga was in place to proceed. 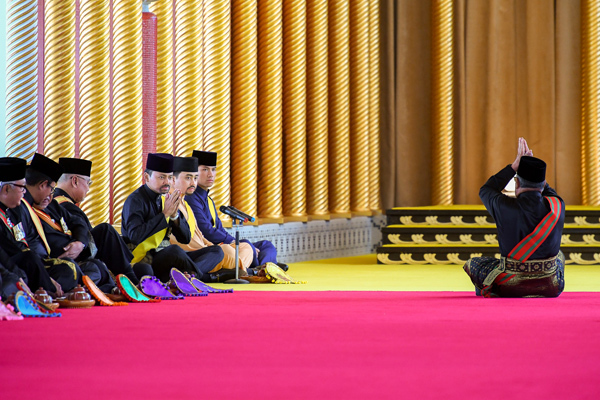 Yang Amat Mulia in turn informed His Royal Highness the Crown Prince that the ceremony was in place to proceed. 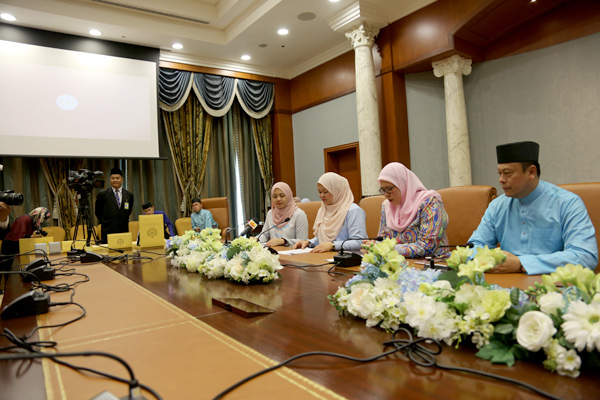 His Royal Highness the Crown Prince subsequently instructed for the Istiadat Membuka Gendang Jaga-Jaga to commence. 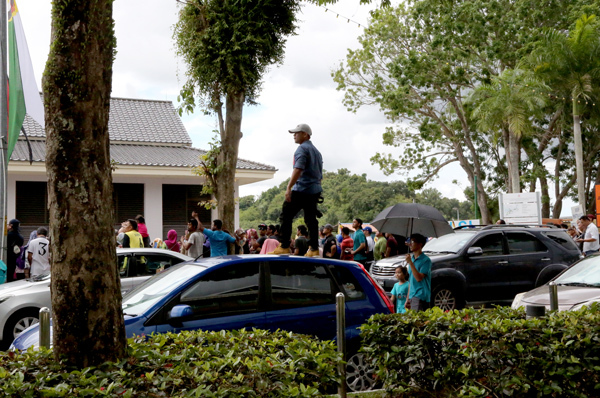 The Juru Laki Awang Haji Johan Areffen proceeded to the Patarana from the left-hand side to lift the Nakara, a type of kettle drum, and bore it upon his head. 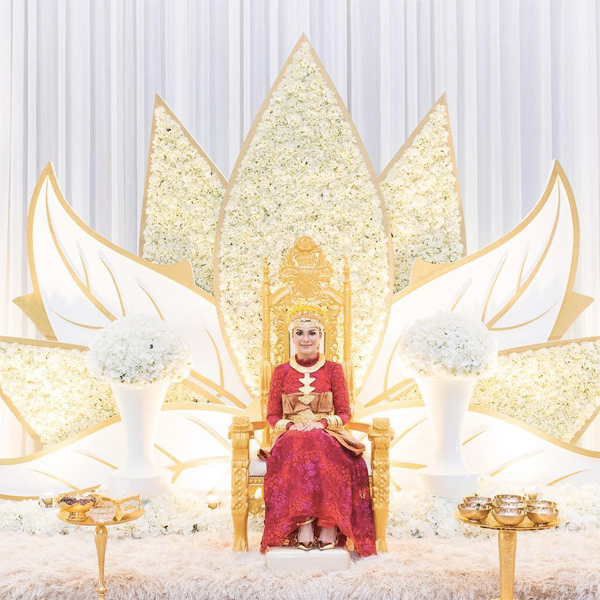 Nakara is one of the royal regalia used in an Istiadat such as the Golden Jubilee Celebration of His Majesty the Sultan and Yang Di-Pertuan of Brunei Darussalam’s Accession to the Throne. The Nakara is the top among the traditional items or the Naubat. 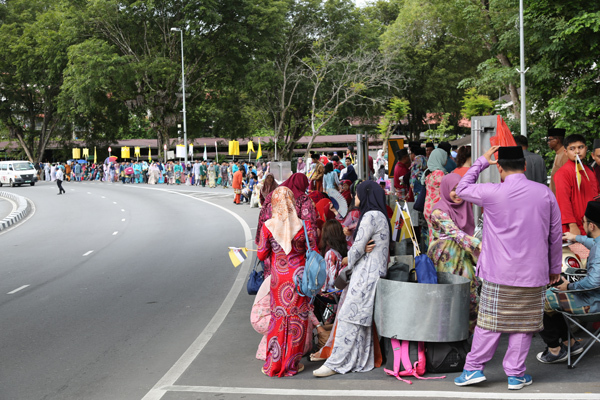 Due to these, it is located higher compared to the other Naubat items and carried by the Juru. It is also placed in a special position – on top of the crown box. It is said that the Nakara’s sahap is made from Tuma’s skin. 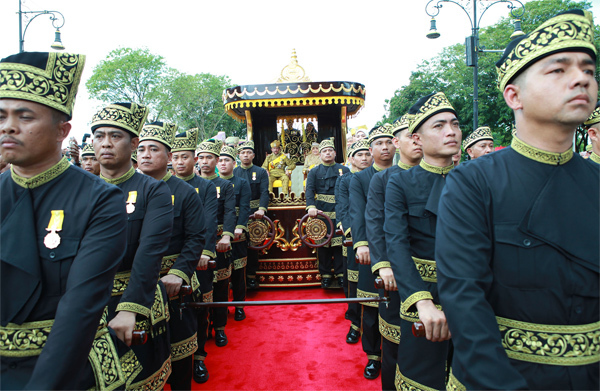 The beating of the Nakara then commenced followed by the playing of Gendang Labek, Serunai accompanied by Agong and Chanang, types of gongs. The beating of the Nakara was accompanied by a twenty-one cannon-fire salute. 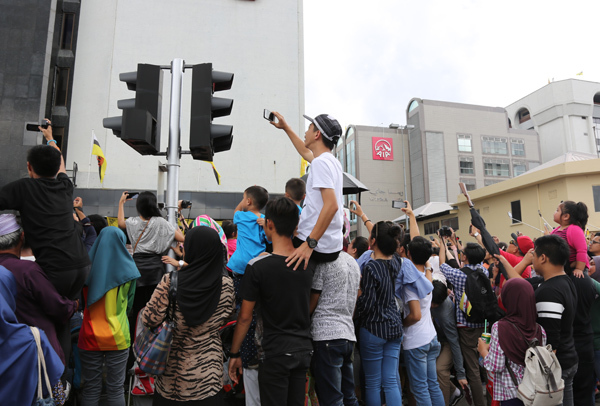 It was followed by the beatings of Gendang Alih-alihan Tengah and Gendang Alih-alihan Hujung, until finally reaching the titir Gendang Perang or War Drum beats. 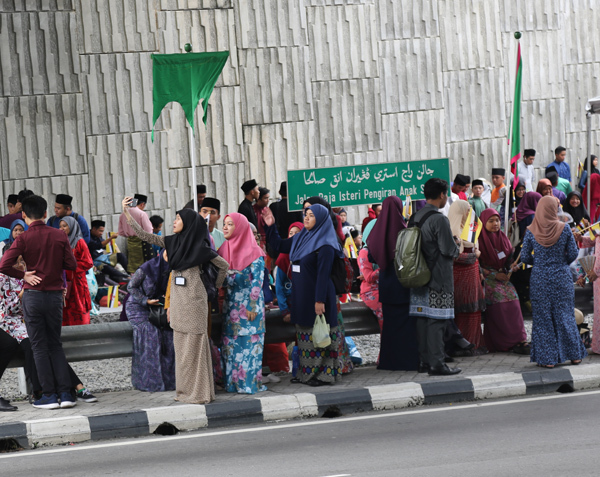 The Istiadat Membuka Gendang Jaga-Jaga is carried out in a special ceremony, just like the The Istiadat Membuka Naubat or Opening of Naubat. 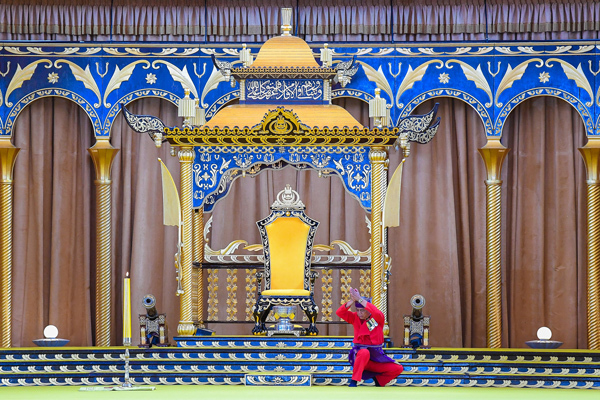 However, it is conducted in a specific time, same as other regular ceremonies. 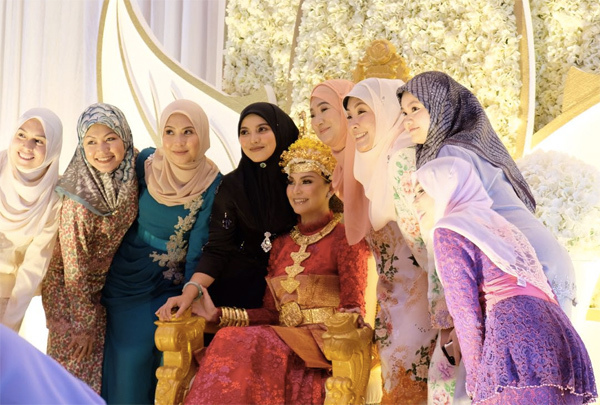 The venue, guest, rules, how the ceremony is carried out as well as the lifting of the Nakara is similar to the Istiadat Membuka Naubat. 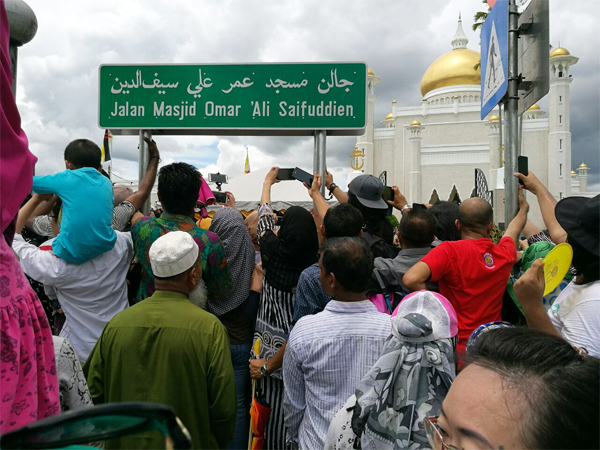 The only difference is that the Istiadat Membuka Gendang jaga-jaga began with the beatings of Gendang Perang, followed by Alih-Alihan Tengah, Alih-Alihan hujung and ended with Gendang Perang. 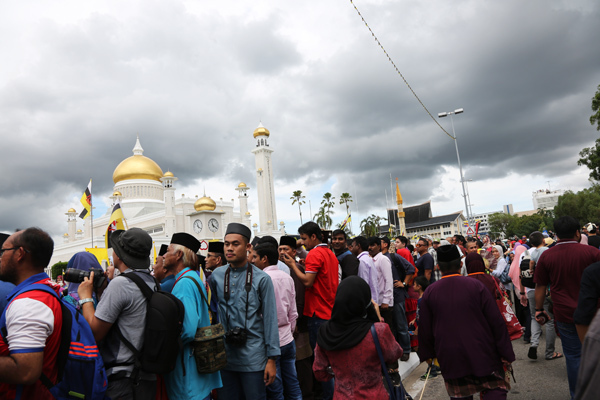 Doa Selamat was read by Yang Berhormat Pehin Datu Seri Maharaja Dato Paduka Seri Setia Doctor Ustaz Haji Awang Abdul Aziz bin Juned, the State Mufti. 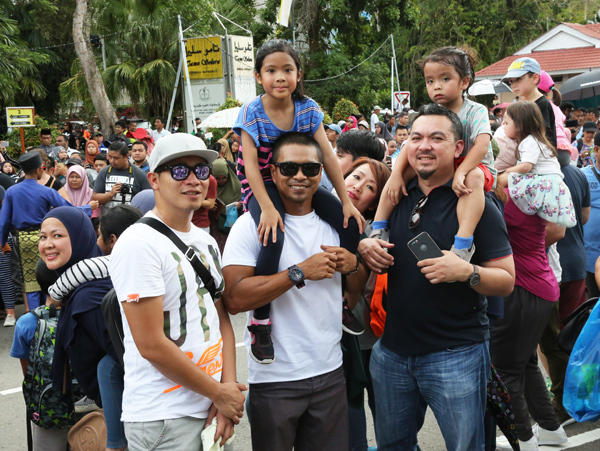 The Juru Laki Awang Haji Johan Areffen sought consent to carry the Nakara through the centre of the audience. The Nakara was then returned to its original location. 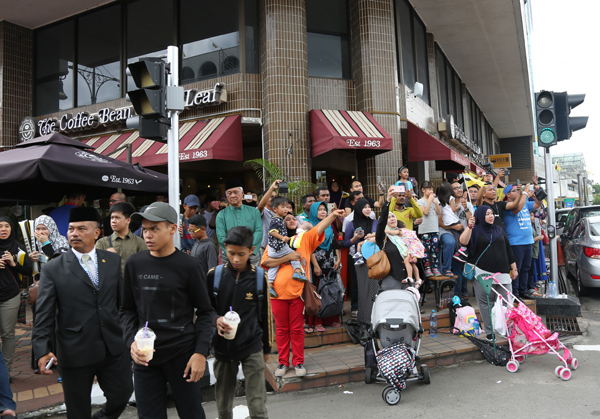 Yang Dimuliakan Pehin Orang Kaya Seri Dewa Retired Major General Dato Seri Pahlawan Awang Haji Mohammad then informed Yang Amat Mulia Pengiran Lela Cheteria Sahibun Najabah Pengiran Anak Haji Abdul Aziz that the Istiadat Membuka Gendang Jaga-Jaga has been duly carried out. 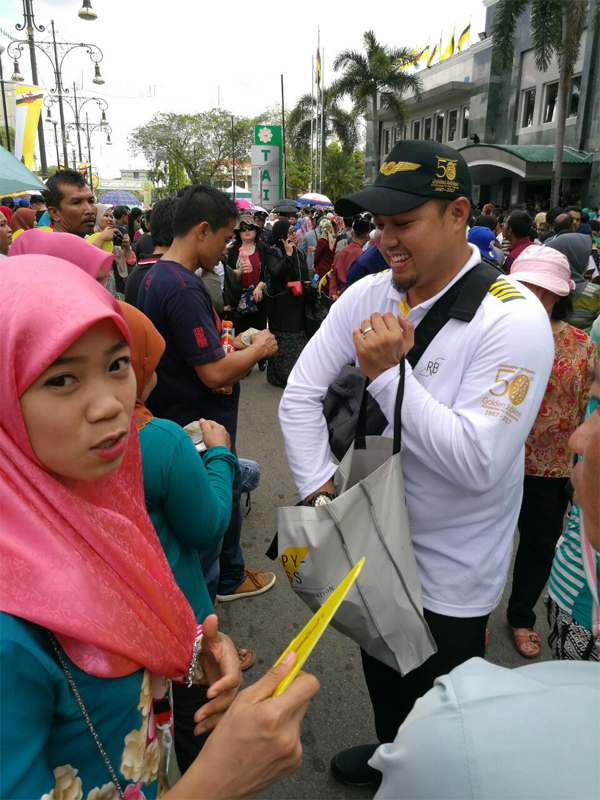 Yang Amat Mulia in turn informed His Royal Highness the Crown Prince that the ceremony has been duly carried out. His Royal Highness Prince Haji Al-Muhtadee Billah, The Crown Prince instructed Yang Dimuliakan Pehin Orang Kaya Seri Dewa (Retired) Major General Dato Seri Pahlawan Awang Haji Mohammad to confer His Majesty the Sultan and Yang Di-Pertuan of Brunei Darussalam that the Majlis Istiadat Membuka Gendang Jaga-Jaga for the Golden Jubilee Celebration of His Majesty the Sultan and Yang Di-Pertuan of Brunei Darussalam’s Accession to the Throne was duly carried out. His Royal Highness the Crown Prince then left the ceremony. 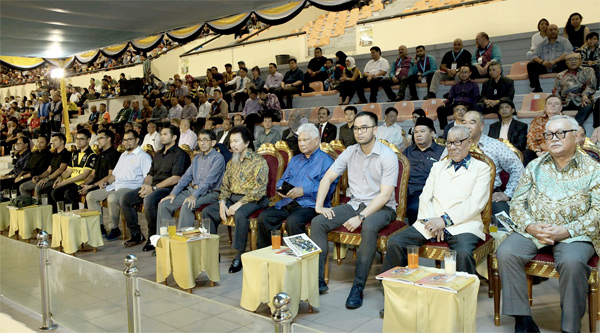 Present at the ceremony were Pengiran Cheterias, Cabinet ministers, Members of Councils, Deputy Ministers, Pengiran-Pengiran Peranakan, Pehin-Pehin Manteri, Manteri-Manteri Hulubalang, Manteri-Manteri Pedalaman, Heads of Diplomatic Missions, Members of the Legislative Council, Permanent Secretaries and Heads of Government Department. News courtesy of RTB and images courtesy of Information Department.